So, it is done. Trump is President. For those of us who care deeply about the environment, wildlife and climate change, we’re heading into the abyss again, as we did during the Reagan and GW Bush years. Except this time, the right-wing is far to the right of previous presidents. The sad truth is, there are few moments in history when the environmental community has a president and/or congress fully on our side – a bit under Clinton, and the most so far under Obama. As Trump enters the Oval Office, those that did not vote for him in the US and people around the world are literally trembling with fear. Even the right-wing groups in Europe don’t threaten to take apart everything the population holds dear. But we face a complete reversal of just about every policy and value. 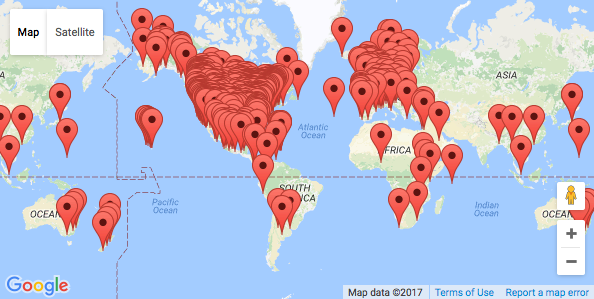 Saturday’s Women’s March has gone global and includes many interest groups, including the environment. 600 “sister” marches are taking place in 57 countries to protest far-right populism. It’s pretty incredible – progressive groups across the world are rising up. At the same time, right-wing groups across Europe will be holding their first “Counter-Summit” in Koblenz, Germany. Mainstream media are not allowed to cover the event! Yesterday, a version of Drudge Report and Breitbart “News” launched in Britain. Called Westmonster, the person behind it is millionaire Arron Banks who funded the Brexit “Leave” campaign, reports DeSmog UK. In the States: Republicans have already introduced bills in five states that would make nonviolent protests a criminal offense! In North Dakota, for example,motorists would be allowed to run over and kill any protester obstructing a highway as long it was done accidentally! In Minnesota, protesters could face stiff fines for blocking highways and could receive a year of jail time. In Washington state, protests deemed “economic terrorism” would be reclassified as a felony.“A law that would allow the state to charge a protester $10,000 for stepping in the wrong place, or encourage a driver to get away with manslaughter because the victim was protesting, is about one thing: chilling protest,” states Lee Rowland, an attorney with the American Civil Liberties Union. In Congress: Republicans have already revived some of their favorite bills that could never pass under a Democratic president. The bills inject politics into the science-based process of creating regulations. Midnight Rule Relief Act allows Congress to repeal – in one package – regulations passed over the past year. REINS Act (Regulations From The Executive In Need of Scrutiny) gives Congress control over new regulations. If Congress doesn’t approve it within 70 days, it simply can’t be implemented. Regulatory Accountability Act makes it very hard to set new regulations by bogging the process down with over 60 new steps.These bills “give Congress sweeping authority to substitute political judgement for scientific judgement. It gives Congress permission to ignore all the years of technical work and public comment used to develop public health, safety, and environmental protections, and simply dismantle all these vital safeguards in one fell swoop,” says Union of Concerned Scientists. It’s ironic, because federal agencies develop regulations at the behest of Congress in the laws they pass!